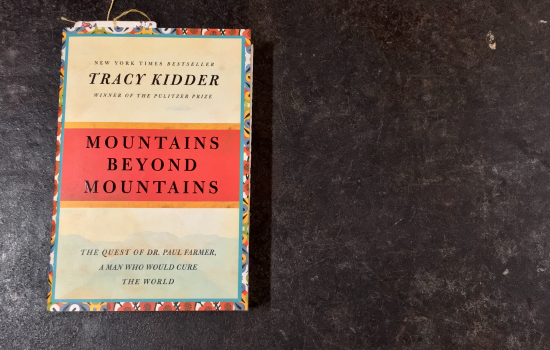 Today’s book club discussion focuses on Part III of “Mountains Beyond Mountains,” by Tracy Kidder. In Part III of “Mountains Beyond Mountains,” readers learn more about Farmer’s past, a pivotal part which included Father Jack Roussin. Father Jack was the priest at St. Mary of the Angels where Farmer lived while in medical school. After moving to Lima, Peru, in the early 90s, he eventually convinces Farmer to open a Partners In Health branch there. This is a momentous step as it is the first PIH clinic that Farmer opens beyond Haiti’s borders, and marks the beginning of a new chapter in his fight against tuberculosis. As Farmer is evaluating the current TB problems in Lima, Father Jack becomes ill with that very disease. Tragically, he develops MDR, which is the drug-resistant version of TB, and ultimately succumbs to the disease. Devastated by the loss of another friend and mentor, Farmer continues his work, spending more time focusing on MDR-TB. He travels to Chicago where he makes a speech and addresses a number of myths surrounding MDR-TB, pointing out that it is costly in the long run to ignore the disease. If left untreated MDR-TB would only grow, and it is, in fact, rather contagious. Ironically, Farmer feels himself becoming ill. He remains untreated until he finally relents after being convinced to seek medical help. Much to his surprise, Farmer finds that he has contracted Hepatitis A. The MDR project was making huge progress, but there was one large issue that Farmer and many physicians were struggling with: how do you use limited resources? While Farmer didn’t have a definitive solution to the question, his partner, Jim Yong Kim, encouraged his colleagues to press forward. As Part III comes to a close, we see Yong Kim come out of his shell, determined to fight for the cause he believes in, confident in his abilities to take PIH to the next level. Paul Farmer finds ways of inspiring people whose backgrounds are vastly different from his own. How does he do this? Is this something to which we can all aspire? Compare the descriptions of Peru in Part III to early descriptions of Haiti in Parts I and II. How are they similar and different? Don't forget, we are hosting our first live online book club discussion on Tuesday, January 26. Sign up to join us. We can't wait to hear what you think of the book!